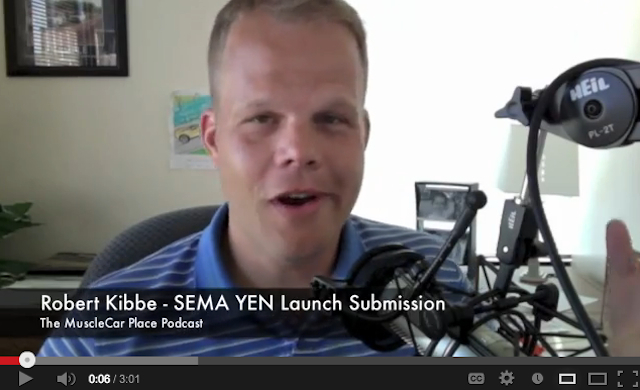 You are here: Home » Rob's Blog » Help Rob Get Into the SEMA Shark Tank – By Sept 5! A screen grab of my video submission to the SEMA “Launch Pad” competition. You’ll be shocked to know that this was the most flattering image I could pull from the video. Dammit. TMCP Fans, countrymen, and everyone in between….I need your help. After 4 solid years of growing The MuscleCar Place from a desk in my basement near the water heater to something that actually puts bread on the table for my family, it’s come time to take this business to the next level. I need your help. More specifically, I need your vote! If you only read this far, please click the link here, go to the page jump, then vote for my video and click the ‘Like’ button afterward. My video is the middle one at the top. Please note that this only works on a computer – mobile devices won’t work. Also, if you’ve already voted for me you won’t be allowed to vote again….and if you don’t complete this by by 5PM PDT on Sept 5th (which is probably today), it will already be too late. Long story short, I’ve entered The MuscleCar Place into a new competition being held at this year’s SEMA Convention called “Launch Pad.” It’s through the SEMA YEN (Young Executives Network) and is intended to bring business owners and leaders under the age of 40 together in a competition to showcase their new product/invention/concept to a who’s who list of companies for review and exposure….which could lead to (maybe) a partnership down the road due to the exposure it could give , and hopefully earn us the chance to take podcasting about cars mainstream! The competition it’s a lot like the TV Show Shark Tank, and if I make the top 5 contestants I’ll get the chance to present live during the SEMA Show in Vegas during the week of November 4. I already made the first cut to get to this point…but only the top 5 get to go forward. If you know my story at all you know that I’m bringing my Chevelle to SEMA on a wing and a prayer – all through the people, friends, and relationships I’ve made through the unique media medium that is podcasting. I think it’s a huge way to connect with people, unlike anything else out there. Video, print, and even traditional radio can’t touch how we can connect to people through podcasting – and since there are several million people commuting daily with internet access and a desire to listen to something they like, I think they future is wide open. I’m betting a lot on that, as truth be told this is a fun (but hard) way to make a living. To the leaders of Clear Channel Radio (iHeart Radio) and Pandora who are preparing cool things for the future – I hope that this post makes it’s way to you! Again, the contest ends at 5PM PDT on Thursday, Sept 5th. Vote early, then share with your friends. I need your help (as always)!